General Sale begins Tuesday, April 16 at Noon. 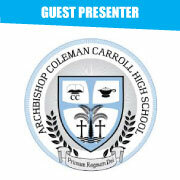 The Archbishop Coleman F. Carroll High School Faculty and Staff present the Senior Class of 2019. We will celebrate their accomplishments and completion of their secondary education at the Awards and Commencement Ceremony which will begin at 3pm. NOTE: Pre-sale begins Tuesday, April 2, 2019 at noon. Available with pre-sale access code only. General sale begins Tuesday, April 16 at noon. Everyone entering the theater must have a ticket regardless of age. This includes infants and children.